I’ve been keeping an eye on the alleged human sacrifices in honor of Santa Muerte (Saint Death) in Nacozari, Mexico, since the news first broke a bit over a week ago. Since the initial story hit, it’s been a rather vexing (if not surprising) slog through the misinformation and tedious sensationalism, with the usual suspects coming out of the woodwork to push a new version of the tired “Satanic Panic” trope. I’m pleased to inform however, that a friend of mine, Joseph Laycock, just posted a story regarding the killings on the Religion Dispatches. With his usual wit, Dr. Laycock deconstructs that bit of irritating nonsense, and provides a nice bit of work tracking how this meme is rapidly developing. I highly recommend popping by and giving it a read. If you’re wondering why I’m taking a moment to post news relating to human sacrifices offered to a Catholic saint, you might want to swing by Dr. Laycock’s other article on Santa Muerte. Among other interesting data of note, he comments on the theory that Santa Muerte is a syncreticism of Catholicism with Mictlancihuatl (aka Mictecacihuatl), the pre-Columbian consort of Mictlantecuhtli and Queen of the Dead. (Her names translate literally as “Lady of the Land of the Dead” and “Lady of the Deadlands People,” respectively.) The first time I came across information relating to Santa Muerte, I had the exact same thought come to mind. Both entities appear as skeletal feminine figures draped in sacred garb. 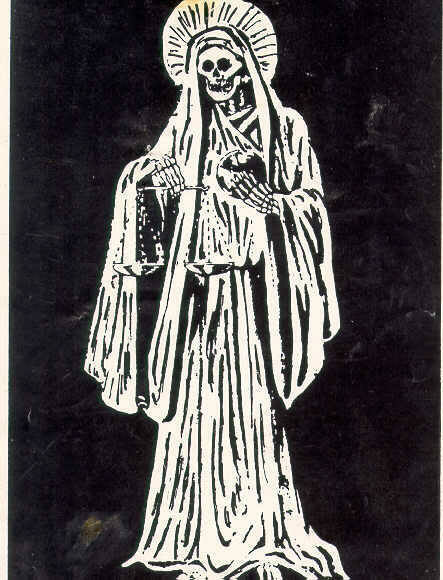 While Santa Muerte’s dress most obviously echoes a combination of Saint Mary (and by extension, the Virgin of Guadalupe, who is herself a syncretism of Tonantzin) and popular depictions of the Grim Reaper, her functions remind me far more of Mictlancihuatl. Both grim ladies have power over material blessings and fortunes, as well as life and death. This combination of dominion over material wealth and death is a signature of the Aztec earth/death deities (the powers of the earth and the force of death are inseparable in this cosmovision, when one gets to the root of it) such as Mictlancihuatl, Tonantzin, Cihuacoatl, and Tlaloc, among many, many others. The offering of blood and human life to Santa Muerte seems to hint that at least some others see this connection between the new saint and the ancient goddess, the tragic manifestation of this understanding in the case of the Nacozari murders aside. With that said, I do encourage you to check out Dr. Laycock’s informative articles on Santa Muerte HERE and HERE, and give the ill-informed and sensationalistic tripe from non-experts floating around on the web a miss. Stay tuned for an upcoming post to stay with the subject of death while linking back to my prior post on the two major anthologies of Aztec poetry.